Old models suitable for recycling. Page 4 features French builders PMP and Rateau. 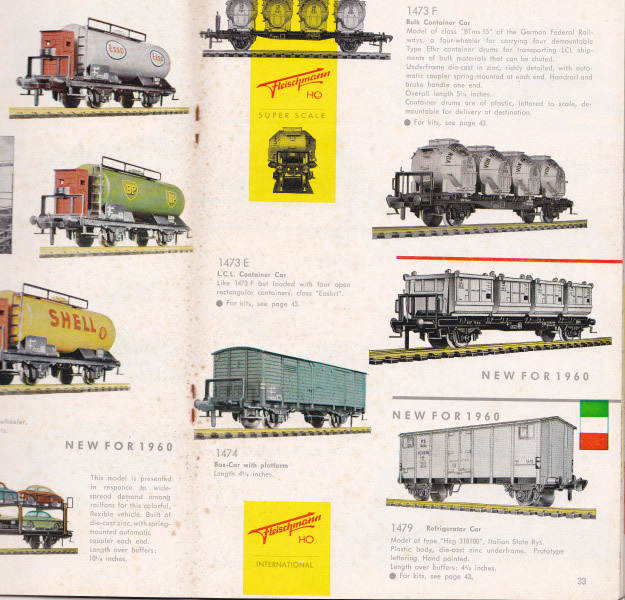 Fleischmann Coaches and Wagons with die-cast underframes – manufactured in Germany in the period 1952-70. 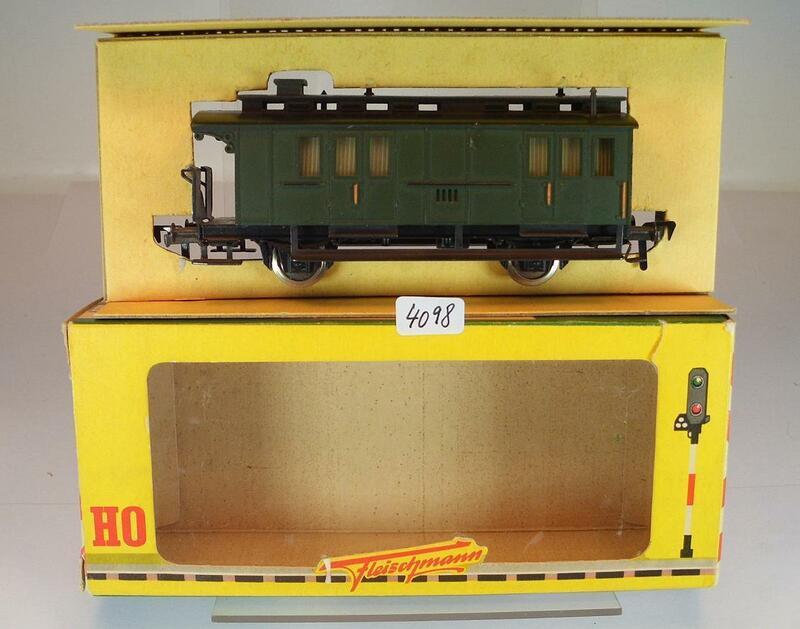 Die-cast underframe train models with 2 axles were made by Fleischmann from about 1952, in the 14** series. Some pundits believe these were built to a scale of 1:82, which differs slightly from the accepted ratio of 1:87 for H0 scale. Over a decade or so the company developed a full line of freight wagons and passenger cars, many based on a series of standard underframes. All bodies (except tank cars) were in molded plastic. The early plastics were a Cellit product and liable to warping, however many have survived in correct shape. I have not referred to the bogie passenger cars, which is a separate subject. The 14** series 2-axle cars are gems of longevity. I have not seen a car with any metal-fatigue, or so-called zinc-pest problems, where the alloy breaks down and expands, or becomes bloated. I really like them for a couple of reasons. A robust standardised set of die-cast under-frame with axle boxes, screw-in buffers, stamped metal end platforms, coupler retainer, steps and running boards. Wheels are free-running pinpoint axles in a removeable stamped metal retainer. Easily change wheels with a screwdriver. A hobbyist can easily change the couplers. The newer 5*** series do not have cast under-frames. I believe the die-cast models are much more fun, and collectible. Here are some Fleischmann under-frames fitted to unique freelance rolling stock bodies made from various parts. AC Fleischmann wheels can be used to suit Märklin track. Couplings and wheels are relatively easy to change, and Fleischmann still offer wheels and coupler parts (as of 2014). Another source for replacment wheels is Das Service in Germany. The 14** series can be obtained from ebay.de, ebay.co.uk, or ebay.com using "fleischmann 14" for the search. You may get a model without a box from around GB6 or €8 each, but condition makes a difference. Boxed examples will sell for twice the unboxed price. No. 1400 (1958-69) - Bi Pr 86 2nd class end-platform short coach, short wheel base, clerestory roof. No. 1401 (1956-68) - ABi 98 a 1st/2nd class end-platform coach, long wheel base, flat arch roof. No. 1402 - BBitr Pr 05 2nd class end-platform coach, clerestory roof, destination Koln (Yellow lettering). Later in 3rd class, destination Ulm (Ivory lettering). No. 1403 (1956-69) - PwPosti 92 baggage wagon with mail section, clerestory roof, one end-platform. No. 1404 (1952-65) – Thunderbox end-platform coach from 1929. No. 1405 - Pwi 28 - Gepackwagen from 1928 - Not in the 1966 catalogue. No. 1406 - a compartment door coach, clerestory roof, and came in both 1/2 class and 2/3 class lettering. Not in the 1966 catalogue. Types of Fleischmann die-cast under-frames for freight and passenger models in 14** 2-axle series. Solid end section only, with axle boxes to slot into another frame. The frameless tank car uses 2 of these sections only. Die-cast frame type used on each 14xx Fleischmann 2-axle model, by catalogue number. As an example, models 1401 and 1402 use the same frame (type 5). Where I lack the relevant information, table cells are in-complete. You can email me if you have information to add to this table. Special casting 96mm length, requires 2 of the type 8 casting to complete - H 10 Bolster flat wagon - no body. 1465 4 120 Until 1954, tank cars of rolled tin-plate were frameless, using 2 end-frames #8 only. From 1954 to 1960, the tank used the frame #4 with a Br house at one end. Br house, R 20 stake wagon, body cast in metal separately. Ballast hopper E433, bogies, casting 123mm. Loaded set - pair consisting of 1483 and 1453. Some example project models using the underframes. 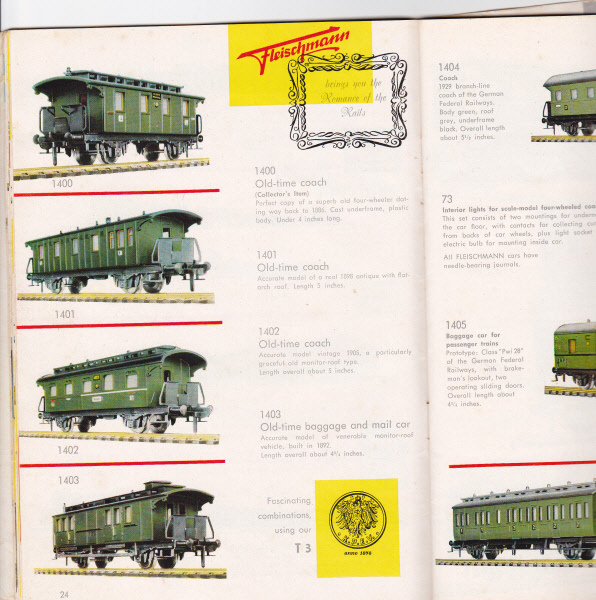 Some privately boxed sets of Fleischmann cars and wagons. 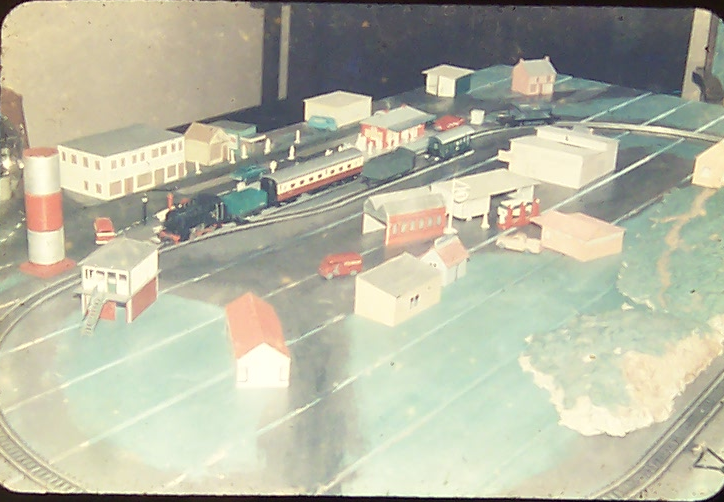 Below is my original 1958 layout, with Fleischmann fibre-based track and a few pieces of rolling stock. This introduced me to the sciences of how the model trains were built, and explains my later and ongoing interest. Four Fleischmann pieces are evident. 0-6-0 tank engine of class 80 - catalogue 1320. A couple of Triang items make up the balance. Buildings were scratchbuilt of cardboard, though the station and signal box were Airfix kits (now Dapol - as of 2014).